What if you could get fit, lower your cholesterol, and lose weight without ever exercising for more than ten minutes at a time? YOGA-LIKE SPARKS FOR FLEXIBILITY AND STRESS RELIEF. These techniques, combined with The Spark's energy-fueling and easy weight-loss food plan, will get you on the road to good health and vitality for life! Chapter One: What Is the Spark? On May 10, at 1:12 P.M., Jon Krakauer, one of the survivors of the ill-fated 1996 Mount Everest expedition, made it to the top: 29,028 feet above sea level, the highest point in the world and the intense, shining focus of the past two months. He stayed at the summit, one foot in China, one in Nepal, for approximately ten minutes. It's an old cliché that academics in ivory towers are not in touch with everyday folks. You wouldn't necessarily put exercise physiologists in that group. After all, we deal with activity: we're out there on the tracks, in the parks, at the gym. You'd be wrong. We might run up those ivory towers two steps at a time, but we still inhabit them. This revelation came to me in 1999, a year after I had convened with my fellow academics of the American College of Sports Medicine to establish the new fitness guidelines for maximum health and longevity. It was then, in a series of conference calls, e-mails, faxes, and meetings, that we proudly and concisely compiled research, statistics, and data that had accumulated over the past eight years. Our recommendations? Perform intense aerobic workouts, 20 to 60 minutes at a time, 3 to 5 times a week, combined with 2 to 3 times a week of both strength-training and flexibility exercises. You've heard this all before. These guidelines have formed the basis of countless magazine articles, books, gymnastics programs, "join this gym" inducements, even infomercials. So what's the problem? Twenty minutes to a full hour. Three to five days a week. Spend your days off lifting weights. And find an hour somewhere in there to stretch. Now, there definitely are individuals out there who would -- and who have -- embraced these guidelines. There are people who exercise at least three days a week at an intensity that would make ice burn. I'm one of them; it's my business and my passion. But it's certainly not a way of life for most Americans. It occurred to me after that day in 1999 that our fitness guidelines were completely unrealistic. That our "ivory tower" mentality encouraged people to start an exercise program over and over again, only to fail and become even more sedentary than before. That our unrealistic expectations motivated people to join health clubs and never set foot in the places after the first three months. In other words, these guidelines, constructed by myself and my colleagues with the utmost commitment to the health of all Americans, have actually contributed to making Americans five to ten pounds heavier than they were a generation ago! But there's more. Not only did we ask Americans to carve out a good portion of their harried week, we also asked them to be patient. All the studies we used to compose our fitness guidelines of course showed significant improvement -- but only after following an exercise regimen for three months or longer. Finally, the third and last revelation hit me: Each study, detailed and meticulous as it was, concentrated on only one or two elements of fitness at a time. There were studies that concentrated on cardiovascular health. Aerobic capacity. Strength training. Flexibility and joint range of motion. Metabolic fitness and weight loss. But there was no one study that combined all these different aspects of fitness to see what the results might be. The scientist in me began to hypothesize. I kept going back to the first page of the printed guidelines where, in parentheses, almost as an afterthought, we stated that a daily workout of at least half an hour could be broken up into 10-minute segments if necessary throughout the day. "What ifs" began to occupy my waking hours. What if a standard exercise program was made even shorter? What if you added strength training and flexibility into the 10-minute equation? What if you never had to do any exercise for more than 10 minutes at a time? Would you still get positive results -- especially in older, more sedentary individuals? And what if you combined these 10-minute bouts of exercise or Sparks with a concrete diet plan? Would you still lose weight? And the biggest question of all: How long would it take to see results? Enter the three-week Spark study at the University of Virginia. It was the ruins at Mesa Verde that got me. These ancient Indian dwellings, thousands of years old, were once inhabited by a tribe that carved out lives from dozens of rocky cliffs. Their stone-and-clay homes had sheltered a people who were active from morning until night: farming, harvesting, cooking, praying. Exercise with a purpose: survival. But that hot summer morning, when my husband, D.J., and I headed for their hills, we weren't thinking about ancient civilizations, and we certainly weren't thinking about exercising. We were thinking about fun. We were on our first vacation in years and we felt giddy with freedom. We'd heard that Mesa Verde, in southwest Colorado, was an awesome site. The only problem with Mesa Verde is that if you want to see the clay buildings, you have to go on your own body power. That means climbing hills. Steep hills. But there we were, armed with water and sunscreen, ready for adventure in the hot Rocky Mountain sun. I was wearing comfortable hiking shoes and shorts. Although my outfit showed every ounce of the forty pounds I'd gained over the past few years, I didn't see it. To me, I was the fairly slim person I'd been in my twenties. This illusion stuck with me all the way down the first slope. It was easy. Nothing to it but a wayward rock or two. But by the time we hiked the uphill path to the first ruin, I was out of breath and sweating. My heart hadn't stopped pounding in my ears, but I chose to ignore it. I distracted myself by imagining the Indians stoking a fire in the earth, murmuring softly in their ancient tongue, waking to the sharp slats of sun coming through slits in their hut's clay wall. After about a half hour, we'd seen everything there was to see. It was time to move on. To walk back up the cliff. No problem, I told myself. My heart had stopped pounding; my breath seemed less ragged. I began to climb. One step. Two. Maybe three or four. I lost count. I was too busy trying to breathe. The edge of the cliff seemed distant, surrounded by a halo of light. The top! I'd never make it. I continued to climb -- and stopped every few feet. Climb. Stop. Gasp. Climb. Stop. Gasp. D.J. had already gone up to the crest. I couldn't even see him anymore. I drank my water. Climb. Stop. Gasp. the sheer terror of embarrassment that a park ranger might have to carry me up, I got to the top of the cliff. I fell onto a nearby bench. I sat and breathed, hard; the air felt like rocks. I waved good-bye to my new friends -- who, oddly, seemed to be recovering more easily than I (especially for their age and weight!). Five, then ten minutes. I sat, still breathing hard. I pretended I wasn't having as bad a time adjusting as I really was, so D.J. wouldn't be too worried. But I was scared. I was afraid that I was having a heart attack -- at forty-eight. I almost wanted to die. I would rather die, I thought, than face this particular fear: that I had let myself go. That I was fat. That I was in worse shape than people who were my mother's age. That I had become that person whom I'd never wanted to be, heavy, unfit, old before my time. How did this happen? In many ways, my studies on the Spark were a natural progression, from my active childhood growing up in the '60s to my position as cochair on the American College of Sports Medicine fitness guidelines committee. I can't remember a time when I wasn't moving, running, sprinting, jumping. I never sat still. If there was a football game or a baseball game, or even an hour to throw around a few balls, I was there. Being active was a way of life. I just didn't know that a sedentary lifestyle was an option. In high school, I discovered that I was good at running, that I had a high aerobic capacity. I ran competitively and won a couple of awards. Even today, if I don't get my run in on a daily basis, I'm uncomfortable. I miss the physical, emotional, and spiritual "high." It was this passion for movement that led me to study exercise physiology at Berkeley, where I studied peak performance in athletes. I loved my work and enjoyed publication in many journals and a professorship at the University of Virginia. But something happened along the way. Athletes stopped being a challenge. I began to wonder why I was spending so much time and effort on such a small percentage of the population. My interest began to shift to the general public, in particular to the vast number of people who really needed solid, helpful information on good health and fitness. With funding from the American Heart Association, I began my research on cholesterol, triglycerides, and aerobic fitness with the subjects most available to me: out-of-shape college students. What I found opened my eyes: Doing exercise that barely broke a sweat was just as good as a high-intensity run. It got me thinking that perhaps we don't have to break our backs to get fit and healthy. But there is a trade-off. We might not have to break out in a sweat to see results, but we'd have to exercise for a much longer period of time. It's a reality: The greatest return on an exercise investment definitely comes with more vigorous workouts. But both these suppositions had built-in problems for sedentary people. They wouldn't want to work out any longer than they'd have to. Nor would they want to exercise at an intensity that would leave them crumpled on the floor. That's when my Spark ignited: What if the exercise that people did was intense enough to give them all the benefits of vigorous activity -- but not so long in duration that it was next to impossible to fit into a normal person's schedule? 7 miles in the morning, 5 around midday, and 8 in the late afternoon. By breaking up their workouts, they weren't worn down. They remained strong. It gave them an edge over the competition. If it worked for world-class athletes, why not for everyone? It was time to take my theories to the street. If college students, in their prime, could find significant health and fitness improvements within three weeks, what about people my own age, graying baby boomers who might not have seen the inside of a gym since high school? Could I help them become healthier? The Spark study gave me the answer: a resounding yes. It is quite possible to reverse years, even decades, of sedentary abuse -- within three weeks. My family's "Spark" had nothing to do with physical exercise. Oh, they had a zest for living, all right, as long as they could get there by car. My dad had a large hunger for knowledge and people. And, unfortunately, a seemingly bottomless hunger for food and drink as well. Eating was our pastime, our joy of life. Graduate college? Eat a pound cake. Get a job in your major? Wine and cheese. Sunday night get-together? Thick steaks and hot-fudge sundaes or take-out Chinese food. It's how I grew up, what I knew. Except when it came to using my mind, exercise was as foreign to me as finger bowls and dressing for dinner. I was sedentary from the neck down. When my father died of a sudden heart attack at fifty-two, we called it a terrible twist of fate. It didn't occur to me that my family history was rich in risk. Cholesterol was a strange-sounding word found in scientific journals. I kept going the way I knew best. I found solace (and love, comfort, joy, and relief) in food throughout my life. I even ate while I wrote. Here I was in Mesa Verde unable to breathe, when it hit me as hard as a frozen quart of Chunky Monkey: My family had heart disease. All of us. But what could I do? I couldn't just bounce back with a crash liquid diet or another aerobics class. I couldn't think past the strain of putting on a plus-size leotard. I had a headache. I felt overwhelmed. I was fat. I was out of shape. So what if I was a good person? A good wife? A good daughter? I was still going to die too soon. I looked up at D.J. and smiled. "I need to eat." From the start, the scientist in me plunged into the complexities of the Spark almost to the exclusion of everything else. I went to sleep thinking about muscular strength and aerobic capacity, or an element of metabolic efficiency that needed to be explored. In researching an unrelated topic in my office, I'd find myself going off on a Spark tangent about fiber. I talked about the Spark so much at home that my family began to tease me. rDianne V. came up the gymnasium complex stairs at the University of Virginia huffing and puffing. She walked into my office pretending she wasn't out of breath, trying to smile and say hello. Dianne was thirty-eight and weighed 235 pounds. Heart disease ran in her family and she didn't want to have to take medication later on in life. She'd asked to be a part of the Spark because she'd tried every diet out there and always gained back the weight she'd initially lost. As she was approaching her forties, she realized that she had to take better care of her health, which meant regular, consistent exercise, something she'd never done before. She told me she wanted to be able to walk up the stairs carrying her backpack without having to stop every few steps. Pat S. was five years older, and her goals were similar. At forty-three, she wanted to have more energy to raise her two children, hold down a full-time job, and, whenever she could fit it in, enjoy her personal time more. She certainly didn't want to spend the hour or so she had after the kids were asleep exercising. It felt like work to squeeze exercise in when she was exhausted. Until she joined the study, she didn't know she had any other option. Joanne H., age fifty, wanted to be the best participant in the study. She came on board ready to soar. She was sick and tired of being out of shape. "I refuse to age gracefully." Mary W. had a beautiful face, with the sculpted cheekbones of a queen. During the preliminary testing she learned she had a body fat index that was only slightly above average for her age of forty-two. Mary wanted to lose weight, but she was realistic. After having three children, she knew she'd never be thin. But healthy, toned, and strong was another matter. Each of the forty participants in the study approached the Spark with the same combination of trepidation and excitement, resolve and skepticism they'd approached other programs with. But there was something more here, something fundamentally different. I could feel it and they could feel it. The Spark spoke to them, to their lifestyles and needs. Even more important, it made sense in the context of their lives. When I first put the word out for the Spark study, I assumed I'd get a few responses -- if I was lucky. But within two days, my e-mail was filled with notes from people eager to try out the program. Most of them were out of shape or had gone in and out of exercise programs throughout their adult lives. They were aging baby boomers, men and women, some as young as thirty-two, others as old as sixty-eight. Some had high cholesterol or stiff joints or trouble getting up the stairs. Others lacked the energy to get through their day without a struggle. And still others were fairly healthy and wanted only to get rid of their middle-age bulge. But one common thread tied them all together: a desire to be fit and trim. Strong. Healthy. Brimming with possibilities. The Spark was catching fire. Armed with their initial numbers, the group was eager to Spark. And Spark they did for three weeks -- instead of three months. They built up to a total of 15 ten-minute exercise Sparks a week (divided into a specific number of aerobic, strength-training, and flexibility Sparks determined by the results of their tests). Some of the people in the study walked around the block. Some of them walked on treadmills at home. Some of them lifted weights in their offices. Some of them did stretches before they went to sleep. Some of them danced to music in their living rooms. And, of the initial forty people in the group, all of them stayed on the Spark -- and were ready for more after the three weeks ended. Aerobic capacity improved by 10 to 15 percent, the equivalent fitness level of a person ten to fifteen years younger. Strength and muscular endurance improved from 40 percent to 100 percent, to the equivalent strength level of a person twenty years younger. Flexibility scores increased to the equivalent range of motion of someone younger by twenty years. Weight loss averaged 3 pounds; a consistent, healthy start of about 1 pound a week. Total cholesterol dropped 15 points in the group as a whole -- and by 34 points in those participants in the high-risk range. A 1 percent reduction in cholesterol reduces heart disease risk by 3 percent. This means that the average Spark study participant reduced their risk of heart disease by 20 percent -- and those in the high-risk range reduced their risk by close to 40 percent! LDL or "bad" cholesterol dropped 10 points in the group as a whole -- and 29 points for those in the high-risk range. And everyone who started the study in the high-risk category got out of it! Triglyceride levels decreased from 120 points to 96 -- about a 20 percent decrease in three weeks. The numbers speak for themselves. The Spark was more than "catching fire" now. It had become a flame. I wish I could say that my horrendous climb up the Mesa Verde hills was a starting point for my new life, that it was a completely conscious progression from that heart-stopping tour to the Boston-New York AIDS Ride, the 275-mile three-day bike trek I completed two years later. But it wasn't. To be honest, I didn't even realize what I was doing. I just put my feet to the pedals and ignored everything else. The slogan for the Boston-New York AIDS Ride says it best: "Our greatest fear is not that we are inadequate. Our greatest fear is that we are powerful beyond measure." Maybe you once had a metabolism that never seemed to quit. Energy that kept you going when a deadline was near and the ability to dance all night and come back for more. But somewhere along the way, you lost it. Perhaps your doctor put you on medication for elevated cholesterol; she told you your blood pressure was too high and your triglycerides were going through the roof. Perhaps you learned that you were diabetic, and your future looked gray -- and tasteless. Perhaps the signs were more subtle: You stopped running up the stairs when you forgot something. You started taking your car to go to the market -- one block away. You not only yearned to take a nap in the middle of the afternoon, you needed one to stay awake for an evening out. Do not despair. Your Spark is still there, waiting, like embers in a fire to become a flame. Like so many of the people in the Spark study at the University of Virginia, and like Karla, the steadfast couch potato on the cliffs of Mesa Verde, you too can rekindle your Spark. You too can lower your cholesterol, reduce your blood pressure, keep blood sugar levels within a healthy range, and reignite the feeling of health you once had. You too can lose excess weight, tone your body, and feel incredibly energetic -- at any age. This isn't an empty promise. This is a reality. And all you need to make your own Spark a soaring flame is...a Spark, a quick burst of exercise, ten minutes total. Combined with the Spark healthy diet eating plan, you'll not only steadily improve your health and the way you look but nearly every single aspect of your life, imbuing your mind, body, and soul with confidence, strength, and vigor. All you need is three weeks to see results. And that is a concrete, thoroughly documented, scientifically and medically sound guarantee. Within these pages, you'll learn what I did -- and didn't do -- to change my life during the two years after my ultimately fortuitous Mesa Verde climb. It wasn't easy; when is it ever? We all know some things die hard. Among them for me were my passion for carbs, television, and a reclining position. I was in the midst of all three when I happened to see Glenn talking about fitness on TV on the February 16, 1999, edition of Dateline. I put down my bowl of cereal and stared at the tube. "Ohmigod. This is me. This man is talking to me." The next day, I tracked Glenn down at the University of Virginia and, after assuring him I wasn't some crazed stalker, talked to him about writing a book together. This book was born that February, with Glenn as the authority and I as inspiration: a middle-aged, overweight, at-risk couch potato who, by following her version of the Spark, had become an athlete and fitness instructor, I literally and figuratively changed my life; I lost forty-five pounds and dropped my triglycerides, blood pressure, and cholesterol. Within these pages, you'll find everything you need to rekindle your health, your looks, and your life. You'll begin your three-week journey with a complete understanding of the Spark: what it is, how it works, and why it works. Myths are exposed. Possibility becomes promise. ...exercise personality (and custom-design your activity program, Sparking to your own music at your own time). After you've gotten to know yourself and your individual Spark possibilities, you're ready to begin. The next section of the book provides the actual program: what you need to do and how to do it, week by week. Week One: Embers. Time to move, but only for a few minutes at a time. This is the week to begin incorporating exercise into your life: strength training, flexibility, and aerobics. Week Two: Kindling. You're building up to 10-minute Sparks, 15 times a week. Depending on the results of your Spark tests, some of you will be concentrating on strength, some of you on flexibility and range of motion, and others of you on getting that heart pumping stronger. Week Three and Beyond: The Fire. The Spark program for the rest of your life, the 10-minute equation for health, vitality, and good looks, too. But a fire, whether an ember or a fiery blaze, needs fuel to stay lit. Your body, too, needs fuel, a strong, steady metabolism to keep it going, and that's where the Spark Food Plan comes in. If you diet without exercise, your fire may get the right fuel, but it won't stay lit. You won't be stoking that fire efficiently. Eventually, the fire will be put out; you'll become sluggish and listless. Too much "junk quality" fuel and the fire won't ignite at all. You need the right balance of fuel, the right amount of stoking all day long, to make that healthy burn, to make your body strong and revved up. Spark Fuel (SF). The food you eat each day, especially complex carbohydrate-rich meals and snacks (including cereals, rice, whole grain breads, pasta, beans, fruits, vegetables -- even nuts, bran muffins, and the ubiquitous bagel). Spark Burn (SB). The ideal place where what you eat and what you burn combine, promoting health, vitality, and weight loss. And the element that keeps your SF-SB Flame alive? Spark Fiber. The more fruits, vegetables, and grains you eat, the more effective your SF-SB equation will be. And the more efficient your body is, the stronger and fitter you'll feel and the more weight you'll lose. You'll find the foods you need for vitality and health in the Basic Spark Food Plan in Chapter 5. Along with one full week of Spark food menu plans, I've provided exercise plans, 10-minute Sparks, for you to do. These sample exercise plans are tailored to your specific stage on your Spark journey and include two Embers, two Kindlings, and three Fires (see Appendix A). The Spark way of exercising also promotes an infusion of growth hormone -- that "fountain of youth" that usually decreases as you age. Fueling your Spark means getting your pasta back -- and eating it too. Bagels. Bananas. Baked potatoes and corn. Despite the recent bad press starches have received, carbs, especially those packed with fiber, mean health. In fact, researchers at the University of Pittsburgh School of Medicine conducted a nationwide study that tracked people of all ages who have been on diets -- and found that those who were most successful at maintaining their weight loss ate a high-carbohydrate diet. Strategies to get an exercise Spark in at lunchtime without the sweat. Easy, fast, and efficient 10-minute Spark sessions that include warm-up and cool-down time! A routine of important weight-resistance training and stretching that was used successfully in the Spark study at the University of Virginia. Not in addition to your 15 weekly Sparks, but as part of them. Definitive proof from the participants in the Spark study that these 15 Sparks, done anywhere, at any time, without special knowledge, equipment, or a great deal of motivation, will rev up your metabolism, balance your insulin levels, lower your risk of heart disease, and get rid of excess weight -- all within three weeks! Think of the total package: 10-minute Sparks of exercise that help you lose body fat and look younger, keep your metabolism high, your cardiovascular system healthy, your bones and muscles strong, and your mind alert combined with an easy-to-manage eating plan that promises the carbs you love. Barbara Harris editor-in-chief, Shape A superb guide...The Spark's program is simple, realistic, and can work for everyone. Debra Waterhouse, M.P.H., R.D. 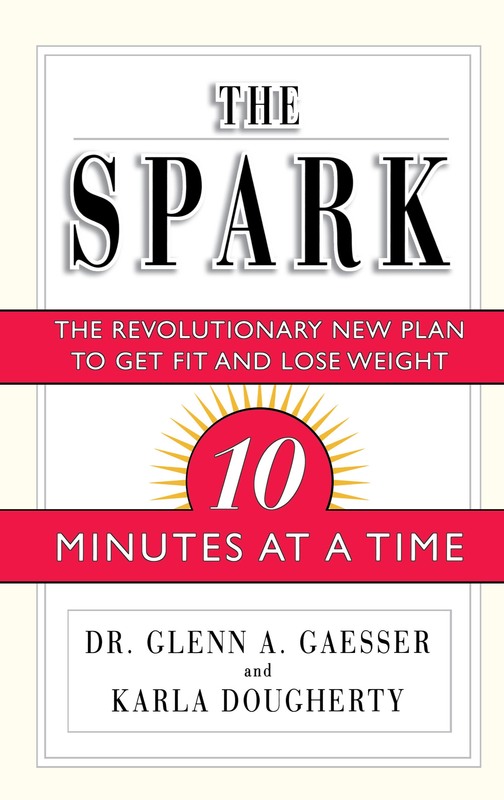 author of Outsmarting the Female Fat Cell If you're one of the millions who want to get fit but can't find time to fit exercise into your busy schedule, Dr. Glenn Gaesser has the solution...The Spark will ignite the fit person within you.